British director Carol Reed’s 1949 classic The Third Man emanates from an ensemble representing the century’s most potent cinematic talent. Collaborations this polished are rare. Peter Bogdanovich says the film is “the greatest non-auteur film ever made” (1). The impressive group who made The Third Man included Reed himself; screenwriter Graham Greene; producers Alexander Korda and David O. Selznick; actors Joseph Cotten, Orson Welles, Trevor Howard, and Italian star Alida Valli; and cinematographer Robert Krasker, who received its only Oscar for “Black-and-White Cinematography”. Also nominated for Best Director and Film Editing, The Third Man’s legend far eclipses the Oscars. In 1949, it won the Grand Prix at Cannes and the Best British Film award (BAFTA). Decades later, the prestigious British Film Institute affirmed its status as the #1 British Film of the 20th Century. However, the greatest contributions from the film’s two creative stalwarts, Greene and Korda, emerge from their real experience of the film’s most important features: its Vienna setting and the conspiratorial themes punctuating its marvelously-paced espionage narrative. The Third Man perfectly illustrates the world it narrates: a post-war, amoral, crossroads checkered Vienna, that is divided into international quadrants administered by the Russians, Americans, British, and French, and populated by a cast of deviant entrepreneurs, racketeers, spies and soldiers eager to prioritise material wealth over ethical principle. Add to this the influence of Welles and Cotten and their experience of making Citizen Kane (1941), and the film’s third major element, its noirish mise en scène, comes as no surprise. Welles said his influence was minimal and gave Reed considerable praise, but as Bogdanovich states, it is difficult to imagine The Third Man without recalling Citizen Kane (2). That is not a criticism; few films can breathe the same air as Citizen Kane but The Third Man is definitely one of them. Nevertheless, a major irony hovering over The Third Man relates to two men who never walked on the set but who can be considered its most important influences, their names rarely mentioned in the annals of cinephiles. As Siegfried Beer points out in his 2001 History Today article, since 1947, the Hungarian-British Korda was determined to produce a film about post-war Vienna and wanted Reed and Greene to direct and write it. Korda was a persuasive soul. By the mid-1930s he had become a full partner in United Artists and a close friend of Winston Churchill. Many believe his production company, London Films, offered cover in Austria for British intelligence operations before, during, and after World War II. In June 1942, Korda was knighted in Britain for his contributions to cinema, but historians have suggested this award was an indirect nod for his role in supporting British espionage efforts (3). A small instance of that contribution introduced Greene, a long-time agent in the British intelligence network, to two eccentric colleagues in the theatre of European espionage. This later proved invaluable to The Third Man’s narrative. Greene’s family was immersed in British espionage history. In the 1930s, Greene’s older brother, Herbert, worked for Japanese, British, and American intelligence outfits. In the mid-1950s, his younger brother, Hugh, co-edited The Spy’s Bedside Book with Greene. His sister, Elizabeth, joined MI6 in the late 1930s and recruited Graham into the British Secret Service in 1941 (4). Greene and Korda’s knowledge of espionage and Austria were a perfect blend for The Third Man, but, as Beer writes, Greene’s long and chummy relationship with legendary British spymaster Harold “Kim” Philby offered the real-life inspiration for many of the film’s themes and scenes. Philby, nicknamed “Kim” for the character in Kipling’s novel, was enmeshed in Soviet espionage efforts in the years leading to World War II. During the Austrian Civil War in 1934, he helped smuggle comrades through Vienna’s sewer system and beyond the Czech border. His relationship with Greene blossomed in an Iberian office fronting for British counter-intelligence. They had similar backgrounds, shared many interests, and, as several biographers have noted, socialised often (5). A more important player in the making of The Third Man was Peter Smolka, an Austrian Communist who became a close acquaintance of Philby. Smolka offered ideas to Greene for the script and was in fact paid £210 by London Films, but he was never given official screen credit. Smolka offered expertise and information about Vienna’s underground sewer systems, black markets, escape routes, and medical supplies market (6). Greene, who wrote the script to Reed’s previous film, The Fallen Idol (1948), based on his own novella, collaborated on the original The Third Man prose with Reed but always intended it would become a film first. He clearly used many of Smolka’s ideas. Philby’s real name was Harold, of which Harry is the obvious derivative; Greene’s first name was Henry, which frequently mutates to Harry; Philby’s and Smolka’s KGB case officer from 1940 to 1944, Anatoly Gorsky, was codenamed HENRY, and Smolka’s pseudonym initials H.P. stood for ‘Harry Peter’. Lime not only refers to a shade of green (Graham Greene) but also a green plant called holly (Holly Martins). Beer also notes that several dialogue exchanges in the film emphasise the conflated identities of these important real-life and fictional characters (7). Another crucial yet unlikely ensemble member was composer Anton Karas, who Reed discovered in an Austrian beer house shortly after arriving in Vienna. Karas moved into Reed’s apartment during the shooting, and his eccentric, modernised work on the zither, a solo instrument, perfectly complements the existential angst Martins embraces when investigating the alleged death of the elusive Harry Lime. Karas’ non-traditional score echoes the morally ambivalent world Martins discovers; where political, national and aesthetic allegiances mutate within confining boxes of urban geography created by an impersonal, ambiguous authority. As Tim Dirks writes, “The jaunty but haunting musical score… lingers long after the film’s viewing with its twangy, mesmerising, lamenting, disconcerting (and sometimes irritating) hurdy-gurdy tones” (8). The instrument itself assumed a leading role in the film’s promotion, with one of its tag lines suggesting, “He’ll have you in a dither with his zither”. Meanwhile, Selznick’s significant contributions are muted by dubious decisions and weaker proposals. His contribution was necessary for financial reasons and to lend the production a few major American actors. Although Selznick believed Welles, whose script work remains uncredited, was “box office poison”, and wanted Noel Coward to play Lime, Reed wanted Welles. Reed also wanted James Stewart to play Martins, and although Cary Grant was also considered, Cotten eventually earned the role. Selznick leaned toward shooting at Shepperton Studios, but Reed was convinced the film needed documentary-style realism for its backdrop. Reed juxtaposed this with expressionistic, chiaroscuro lighting, believing this combination would accurately capture the tense, paranoiac binaries of good vs. evil, hope vs. despair, and New World vs. Old World that underlined the film. Selznick also eliminated 11 minutes of footage for the U.S. release to make Martins, the American, appear more favourable. He struggled with Reed over the ending as well, opting for a more optimistic tone over Reed’s ambiguous conclusion. Fortunately, Reed’s acumen generally prevailed in each instance. Among the giants whose names adorn the credits, Krasker’s efforts are the most endearing. The Third Man’s two most memorable scenes have his fingerprints all over them: the Ferris wheel scene, where Lime confronts Martins and justifies his illegal actions, and the film’s conclusive chase scene through Vienna’s sewer system, where Lime navigates through a labyrinth of sewer canals and escape routes underneath Vienna and its bravura architecture. The first of these scenes adroitly captures the chaotic, oblique visuals so prevalent in film noir. As Martins and Lime ascend, Krasker wisely mixes shots both inside and outside the Ferris wheel car to convey the disorientation Martins is inevitably experiencing. The diagonal lines this creates suggest a world without an axis and a culture of conspiracy where nobody is “straight”. Krasker and Reed’s decision to shoot much of the film in tilted angles further amplifies this feeling. The latter scene represents an apex of film noir lighting techniques. Krasker’s use of low-key lighting, where key light is usually wrapped around a corner in the distance and juxtaposed against either an absent or a faintly subsiding backlight, is textbook noir and reminiscent of the work of another cinematographer churning out brilliant films noir with Anthony Mann during the same period, John Alton. Krasker’s camerawork also depicts the city of Vienna itself as a character, and the many high-angle and establishing shots of the city are deliberately paradoxical: architectural beauty is undermined by rubble and ruin. These shots question our immediate impulse to lament and feel nostalgic; while the cherubic effigies and maiden-like statues seem like spies listening to the conversations below. The Third Man escapes one-dimensional interpretations. One such interpretation, argued by Marc Ferro, highlights the film’s strongly anti-Communist stance and places the film as a Cold War political tragedy. Another interpretation suggested by Pauline Kael, views the film as an indictment against war and its effects on survivors, turning them into “tired, ravaged opportunists”. Another critic, Lynette Carpenter, sees the film as a testament to the power of humanity and compassion amidst corruption and the “attractiveness of evil” (9). Each reading warrants hearty discussion. A number of other idiosyncratic elements distinguish The Third Man from its peers. Beer points out the film’s “religious imagery” and “Christian moralism”, yet an amoral tone resonates throughout. Lime as the charming anti-hero also ethically perplexes the viewer (10). In her Great Directors entry on Reed, Deirdre Feehan suggests that this tension alienates viewers; the untranslated passages of German dialogue disorient the audience, and the sporadic humour adds an ironic twist to a dark tale of deceit. With days as dark as night, the film forces us to smile while placing us in perpetual gloom. Although the film highlights the dangers of drug trafficking, Feehan states, “Four different cameramen shot scenes in the town and in the sewers, morning, noon and night, under the influence of Benzedrine” (11). 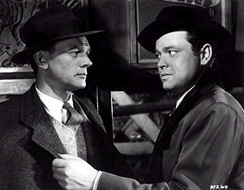 The popularity of The Third Man allowed Welles, in 1951-52, to produce and broadcast a 52-episode syndicated radio show titled The Lives of Harry Lime. The film’s popularity has never ceased and its many accolades have proven Bogdanovich’s claim that the film is not the expression of one primary creative force, but rather, the product of a collaborative effort with contributions from some of the period’s greatest cinematic talents. The Third Man is, simply stated, one of the best films ever made. Peter Bogdanovich, “Introduction”, The Third Man, dir. Carol Reed, The Criterion Collection, 1999. Siegfried Beer, “The Third Man”, History Today vol. 51, no. 5, May 2001, p. 46. Tim Dirks, “The Third Man (1949)”, The Greatest Films. Deirdre Feehan, “Carol Reed”, Great Directors Database: Senses of Cinema, February 2003.